Is in-house design the way to go? With budgets getting tighter, more and more businesses are producing their marketing materials in-house. Desktop publishing packages and cheap or even free design software are giving people the tools to produce their own flyers, newsletters and leaflets but does this always mean that their business is being best served? Marketing materials are used to give customers an impression of your business, to give them a feel of what you are like and what sort of service they can expect from you. If you, or someone on your staff can create designs that look professional and stylish, then that is all to the good but if you can’t achieve that then what are those materials saying about your business? The logo for your business is probably the single most important piece of design for marketing that you have. It is your businesses signature and will appear on every item of marketing that you produce. On a business card, your logo has to stand-alone and describes who you are as well as what you do and hopefully something about the way that you do it. There are websites that offer to ‘design a logo’ for you at very little cost but a logo is a very unique and individual thing – at least it should be – and you really need to be able to talk to the designer, to brief them properly so that they can accurately reflect what you want customers to see that your business stands for. 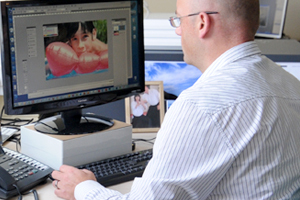 One possible alternative to using a professional design agency is to talk to your local printer. Printers are well aware that their customers need to have finished artwork and designs before they can get anything printed and so it’s in their best interests to help with this. So the printer may offer to design a logo for you – or re-design an existing piece of work – at a reasonable price. Sometimes, it is worth considering having your existing logo re-designed and brought up to date. It is something that big brands do on a regular basis and it can keep your business looking fresh and modern without losing the presence that you have built up over the years. Another possible option to get the best possible design solutions at a reasonable price is to find a freelance designer. Freelance designers are generally self-employed and have lower overheads than a design agency or the design studio at a printers. You might be surprised by just how many freelance designers there are working in your area. Most of them will have a website that you can find through a Google search or you might want to look at a listings site such as Freelanceuk.com. Talk to a few designers before you choose one as – with a freelancer – you will only be working with that one person and it is important that you both feel that you understand each other and can have a good working relationship. Design is a craft and an art as well as a business and so a good rapport between designer and client is more that usually important. As well as design, you will need words. Mailshots, newsletters and websites all need words and where as it is good design that attracts the customer’s attention, it is well written copy that does the informing and the selling. Whereas we all know that we may not be the best designer in the world or have an artistic flair, most people are pretty confident in their ability to write. Writing the text for your marketing materials, however, is a different sort of writing to producing a letter. Sometimes someone who really knows their business and is passionate about it and knows how to talk to customers writes the best web content and the best newsletters and that someone might be you. There are certainly tips and advice that you can follow to help you produce writing that sells and you can find some of those here. If you are not so confident about your skills then, once again, you might want to find a freelancer who will do the job for you. With modern laser printers it is possible to print professional, full-colour newsletters and leaflets in house. One area that you should try not to economise on too much is the paper or stock that they are printed on. Your office supplies shop will have a large range of papers in different finishes and weights and you would be surprised how much more professional something looks and feels when it Is printed on a gloss finish paper with a reasonable weight to it. Business cards should always be printed by a professional printer because of the fine cutting that is necessary to produce the finished result but local printers rates for business cards are usually very good. Be cost effective but don’t make false economies. When the business environment and the economic climate look a bit darker than you would like them too, it is easy to look at your marketing and decide to make some savings there. Obviously a business has to be realistic in what it can spend but marketing isn’t a cost, it’s an investment. As a rule of thumb, your business should spend about 10% of its turnover on marketing. If you completely stop spending and your business no longer advertises or runs promotions or contacts its customers on a regular basis then you can disappear from their view and they may assume that you have done just that; disappeared. Then they take their business elsewhere. It is a proven fact that businesses who keep on investing in marketing during a recession or economic downturn do better than those who don’t. The secret is to make sure that what you do spend is as cost effective as possible and gives you the best return on that investment.